Cruz del Sur, Thrash and power metal unite like never before in a socio-political firestorm that tests the mind and bangs the head. Featuring members of Atlantean Kodex, Lanfear and Them, Septagon pushes subgenre boundaries with technical, yet catchy songs on Apocalyptic Rhymes that are rife with dashing melodies and stellar vocal interplay. As if being in Lanfear and Them wasn?t enough for German guitarist Markus ?Ulle? Ullrich, his power/thrash outfit Septagon provides another canvas for him to color. Formed in 2013 with Atlantean Kodex vocalist Markus Becker, Septagon (who are completed by second guitarist Stef Binnig-Gollub, bassist Alexander Palma and drummer Jürgen "General" Schrank) was created to harness Ullrich?s desire to write fast and tight thrash with a vocalist who could carry the songs over the top. Becker, already known for his work in epic metallers and labelmates Atlantean Kodex, was the obvious choice. Born was their 2016 Deadhead Syndicate debut, an album quickly recognized for its knifing blend of Bay Area thrash and classic power metal bravado. 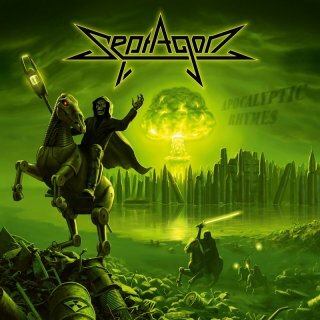 Figuring they could better the debut, Septagon soon wrote and recorded ten songs that would become their sophomore album, the appropriately-titled Apocalyptic Rhymes.Recorded across a variety of studios and produced by the band, Apocalyptic Rhymes is punctuated by a raw, but snappy production job. In turn, the album finds Septagon offering a variety of styles and flavors both musically and lyrically, from the punchiness of opener ?Weight of the World? to the bass-driven ?Home, Sweet Hell? up through the churning title track, where fiery guitar solos from Ullrich and Binning-Gollub and Becker?s vocal acrobatics take form. Even as the album ascends into the spiraling melodic heights found on ?The Unfathomable Evil,? it goes on the attack on ?P.O.T.U.S.A.,? a song inspired by Becker?s time in America and is critical of the current presidential regime that has divided the country. Apocalyptic Rhymes eventually crests on the closing ?Sunset Blood,? a lush, epic construct that allows Septagon to stretch out musically to include acoustic guitars, twin guitar harmonies and carefully-plotted vocal spots. An album sure to stand out among the dime-a-dozen traditional thrash and power metal entries, Apocalyptic Rhymes is an unapologetic bold step for Septagon, a band unafraid to not only push musical boundaries, but political and social ones as well.